In 1853 this county was established by and named after James Goodhue, a lawyer and newspaperman from the East Coast. The area soon became known for its fertile soil, water and woods and for being very picturesque. Most Norwegians settled in the west of Goodhue, and the first to come weren't from Holla but they soon came and gave the name `Holden Township' to the newly-built area. Later, this name was also chosen for a congregation and church in the town. `Holden Academy' was a local high school. It was started by the congregation's first pastor Bernt Julius Muus in 1869 and existed only for a few years. The thread was taken up again in 1874 with a new name - and many are familiar with St.Olaf's College today! 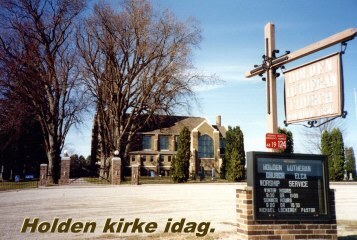 Holden congregation was established in 1856 and was the first Norwegian congregation in Goodhue. They didn't have a priest for another three years when pastor Muus came. This pastor Muus was a very gifted and energetic man, but also controversial. His first service was held on Ole O. Huset's farm. 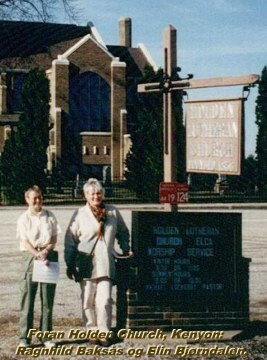 Before the first church was finished in 1861, all services were held on one or another of the local farms. Amongst others the names Briskemyr and Nils Kvernodden crop up. Other names from Holla were Holtan, Halvor Huset and Kjøstol G. Næseth. 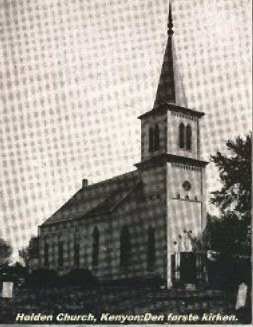 Many were people who had moved from the first Holden congregation in Port Washington, Wisconsin. The area the priest covered was very large - about half the size of Denmark. 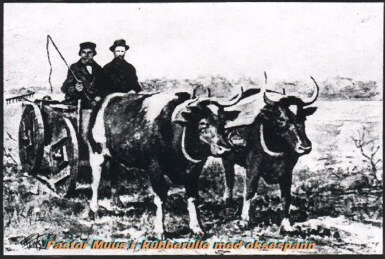 In one year pastor Muus travelled about 7000 miles by oxen or horse drawn cart, and occasionally on foot! Because of this problem the `parish' was split up into smaller parts: Vang, Dale, Lands, Urland, Hegre, Moland, Gol and Hoff were some of the names with a Norwegian sound. Pastor Muus was also known for the court case between him and his wife. This was among other things over an inheritance Mrs. Muus received from a relative in Norway. According to Norwegian law in those days the husband had the property rights of any land the woman received. This did not tally with American law. When Oline didn't get the money she thought she was entitled to she took her husband to court. It is easy to imagine a certain unease in the priest's house at that time, and the case ended with both of them living their lives out with separate means. After a while the first church became too small so in 1934 a new one was built, and this is the building which exists today if you travel to Kenyon in Minnesota.